Last edited by Al A; 09-10-2018 at 06:41 PM. I wonder how bad it is under the wrap. There was a guy on here who had his car wrapped and they scratched the crap out of it when they trimmed the wrap. If I were to buy it, the wrap would have to be removed before I handed over a dime. Just looking at the future.....20/30 years down the road, barn find?, left behind the house?, owner died after finding out his $ 70000 HELLCAT was only worth $5000 after the big oil embargo 2 years after he bought the car he paid cash for? Car stolen and buried found 30 years later? A time capsule car like the Dodge that was sealed up, put in the ground and then dug up, found that the seal process failed? Stolen car from a bank robbery and dumped in a swamp filled with gators? This is what they'll all look like after the zombies come, and they're converted to run on fermented human remains. 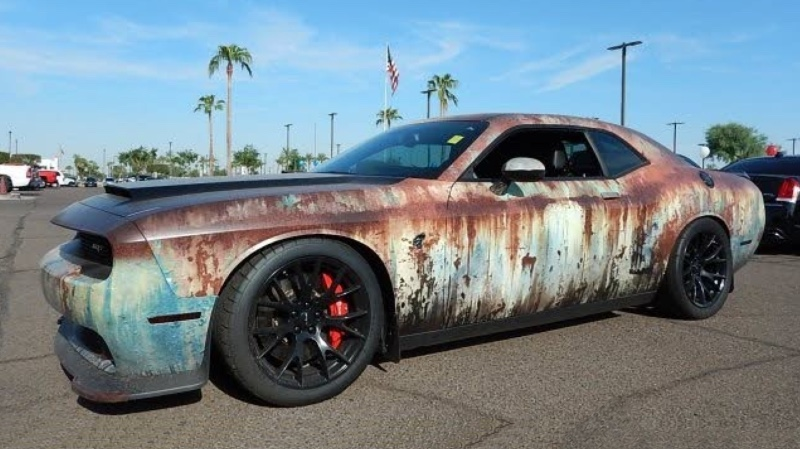 The owner of this Hellcat needs therapy. The Walking Dead should really feature walking. LOL. I love how on The Walking Dead they can hop in a car that has been sitting for three years, fire it up and drive away when I can't get any of my power equipment to start if it has three month old gas in it! In the past five years I have replaced the carb on my snowblower twice (one was just new Chinese junk), my 4hp outboard once and my lawn tractor once. I have also cleaned all those carbs and the one in my generator many times. Bad gas has made me so nervous that I bought a $100 transfer pump to pump out the tank on my 73 Challenger, which I filtered through a water separator and ran through my pickup truck a few gallons at a time until it was gone. I also have a tank full of very gas in my 1964 Dart that I am damned if I know what to do with. Maybe have a bonfire with it! If the f-ing government would do the math on the negative economic impact of 10-15% ethanol in gas they might actually stop kissing big corn farmers asses and STOP already.